The Need for Cognition Scale is a survey designed to measure people's enjoyment of and desire for complex, effortful thought (cognition). It is related to both fluid intelligence and the personality trait of openness to experience. People with high scores tend to seek out challengning intellectual problems and express curiosity about a wide range of topics, and can feel deprived without such stimulation. The task you will engage in to complete the Need for Cognition scale is a simple survey. You will see 10 statements, one at a time, and rate them with respect to how well they apply to yourself on the 1-5 scale shown above (left). At the end of the study, you will be presented with histograms that reflect the distribution of other participants' responses on the Need for Cognition scale. 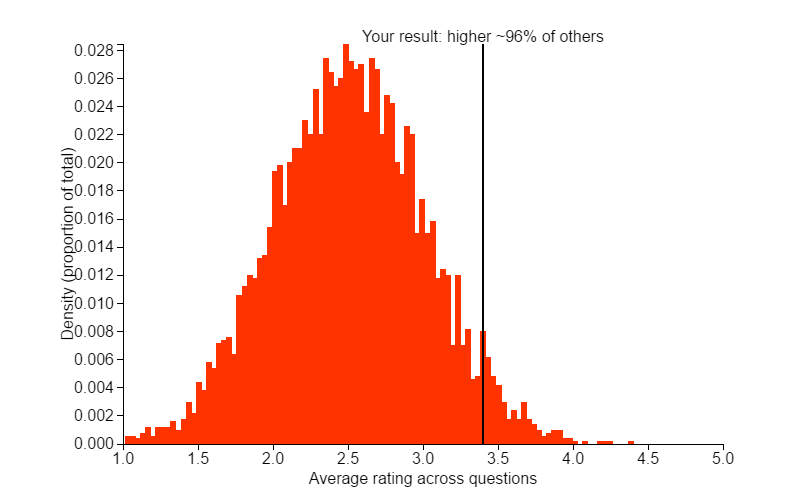 Your scores relative to others will be shown via a vertical line, as shown above (right). Please note that receiving a high or low score on this survey is not necessarily a good or bad thing. There are both advantages and drawbacks to having a high need for cognition, and only you can decide how to appropriately weigh the information the survey provides. If you wish to participate in the Need for Cognition survey, please click the button below.